The School of Design invites everyone to the opening reception for current exhibitions in the Bethea and Moffett Galleries at the F Jay Taylor Visual Arts Center. 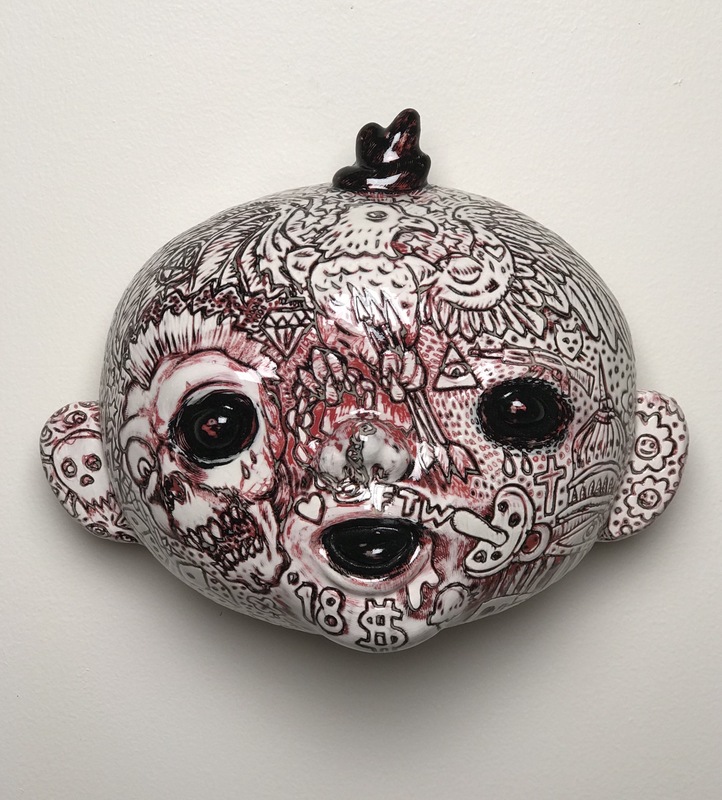 Ceramics artists Jeff Brown and Benjie Heu will present artists lecture related to their exhibition Brown Hue now on view in the Moffett Gallery. An audience Q and A and closing reception follows the presentation. Refreshments generously provided by Ponchatoulas Restaurant. Both galleries will be open for viewing and all are welcome to attend! Illustrated objects communicate with the viewer much like a multiple-panel sequence in a graphic novel. I employ simple but richly textured surfaces to transform easily relatable and yet often overlooked anxieties of everyday life – the frailty of our bodies, the specter of chemical dependency, religious uncertainty, family dynamics, etc. – into figures or obstacles to be faced by the viewer. Battles against time, against the obstacles that prevent the fulfillment of desire, or the repossession of something cherished but lost are themes that provoke me. Revealing truth and humor in the face of horror and the seemingly absurd is my answer. Ceramics and Drawing is an immediate and accessible format for me. I prefer simple line carving and mark making because of their concise nature: time sits still or zigzags through a composition. The most outlandish adventures are accounted with an eye fixed on the bare essentials. Translating oral narrative into a visual narrative not only reveals the significance of the story but it teaches me about myself and extends that revealing devise to the viewer. Jeff Brown has been part of the Nicholls State University family since 2003. He teaches all levels of ceramics and art appreciation. He also codirects the Ameen Art Gallery and is co-advisor for the University Ceramics Club. Prior to teaching here at Nicholls Jeff worked at the Arrowmont School of Arts and Crafts in Gatlinburg, TN as a program assistant and studio manager. Associate Professor Brown works primarily with clay, exploring both functional pottery and sculptural forms. He also builds contemporary furniture and sculpture. His work has been exhibited in regional, national and international exhibitions.